Moving out of Commercial Drive, we are excited for what lies ahead. This isn't a "good-bye." It's a "see you soon." Firstly, thank you to all customers, friends and the entire community that have made our stay on Commercial Drive such a memorable and wonderful one. Despite my not being present for the birth of dandelion KIDS on Commercial Drive, it has been a privilege and honour to have met and worked with so many of you during the time that I have had with dandelion KIDS. All of you, consisting of our customers, little shoppers, visitors, tourists from afar, suppliers, friends, neighbours, and the Commercial Drive BIA have supported and aided our growth especially over the last two and half years. Coming to the decision to close our original store was not an easy one and seeing all of you come out to support our moving out and dropping by to say "see you later" has been extremely heartfelt and nice. Visits from team-members that have left to pursue college jobs has been a bonus and have made me feel that we did indeed build a family while we were here. You have all been so supportive and genuine. Some have come in with offers of hugs and some have even come in to our defense asking if we were forced to leave. Firstly, let's just nip that in the bud. We were definitely not forced to leave. 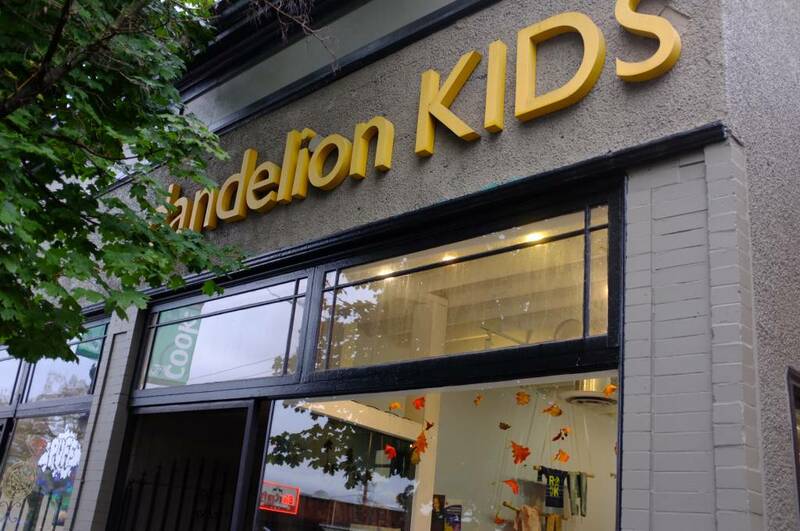 dandelion KIDS on Commercial Drive has had an amazing landlord who has supported our growth and development over the years and tried to maintain the integrity and the local community vibe of the Drive. Working with him has been a pleasure. The timing of everything just pointed out to us that our business needed some restructuring and space to grow. While being so busy running our physical Commercial Drive location and Port Moody store that opened in 2009, we have neglected one other store that we have -- our online store. Thus by taking this side-step, we hope to give our online store a little more of the TLC that we have not had time to offer it in the last couple of years. We are definitely not disappearing; we love the interpersonal contact and continuing to meet all of you as well as providing you with the face-to-face assistance and expertise in which we are all trained with. Whether we are fitting your children for shoes or providing insight on our products, we will always strive to provide the service and attention that you need as well as source out a variety of products and tools that will help with the growth with your children. Our Port Moody store in Suter Brook Village will continue to be a vital part of dandelion KIDS. Thanks to those that have already come out to visit from Vancouver and realized that it isn't a far trip at all. Since September 2017, it's been Skytrain accessible and we have seen more and more familiar faces shop between the two stores. We look forward to seeing more of you at this location. Our online store, www.dandelionkids.ca will be updated with new inventory and items shortly as we finalize our closure at Commercial Drive and then train and build our team to manage our webstore. We look forward to moving with the times and growing this store as well so that we can provide a better shopping experience to those of you that have come to recognize dandelion KIDS. We understand that sometimes our customers cannot always come out to shop, want the ease of delivery to their doorstep or even to the doorsteps of loved ones across the continent and maybe beyond. In time, we hope that we will be able to meet your needs in that area as well. We may be moving out of Commercial Drive for the time being, but we are definitely not going away. Follow us on Facebook, Instagram, Twitter or send us an email to info@dandelionkids.ca if you'd like to stay updated. If you'd like to join our email list, send us a shout out and we will add you onto our email list to send you a monthly update about how we are doing.